Finally the Blackberry has some good news. First it announced a profit on Wednesday and now in sync with its launch of BlackBerry Z 10 in United States, the MLB.Com has launched a App for Z10 users all over the world. Baseball may not be a hot favourite in India and developing countries but it is a rage in the US. To take advantage of the fact and supercharge its sales, the BlackBerry and MLB Advanced Media, LP. have come together to launch the MLB.Com App for Z10. The opening day of the Major League Baseball season is March 31 and users who sign in with annual $19.99 fee will have access to free MLB.TV Game of the Day. Dedicated baseball fans with MLB.TV premium subscription will aslo be able to log in and watch every out of market game live and or/on demand. The app also includes home and away audio commentary. In case you miss you will get the condensed highlights of the match alongwith the team reviews, views, match stats, ranking and future schedule. Even old timers can have fun because MLB.Com At Bat also has a library of old matches for your on demand streaming. 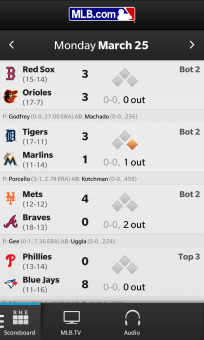 So if you are a Baseball lover and a Major League afficionado, download the App here from BlackBerry World. Be sure to shell out $19.00 (Rs.1050.00) for the same but if you are true lover of baseball the money shouldn't be a problem. Please post your comments on the article and add me to your Google Plus circle by clicking here.